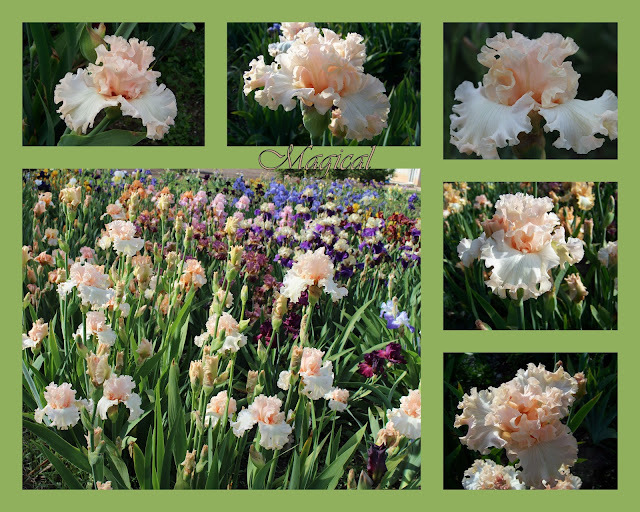 Each spring we enjoy watching our iris garden's rebirth after the cold freezes and snows of winter. It is so fun to see all the newly planted rhizomes bloom for the first time. It is also fun to see the older irises that open each year so faithfully. It is like seeing old and dear friends. Neal, my husband, and I have what we call "The Super Achiever Award”. Although it isn't a bonafide award with a trophy or certificate, it is recognition by us for doing a good job. This award goes to those irises that really go the extra mile to grow vigorously, bloom more, rebloom more, make a pretty mound or just show off. It seems to be the same ones almost every year unless they have just been divided. I would like to show you some pictures of those extra nice irises. I highly recommend these because you can rely on them to perform well if your climate is similar to ours. We are in zone 6b in northern Utah fairly close to the Idaho border. 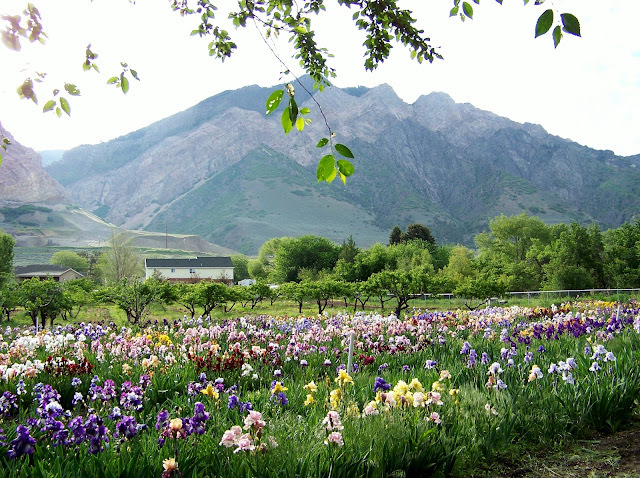 Our home is 4,300 feet elevation and there are three 9000 ft peaks east of our garden just a few blocks away. Average rainfall is 16 to 18 inches of rain per year. We are classified as a desert with only Nevada being dryer. We also have temperatures that go over 100 in the summer and sub zero in the winter. Irrigation is a must and we do plant our rhizomes with about 1 inch of soil over the top for protection from the extreme temperatures. This post is especially for those of you who may have very little space for irises, since you will want the ones that grow vigorously. I will show the pictures and explain why we gave that iris our award. Here is our iris patch just waking up from a long winter. 'Jesse’s Song' is in the middle and 'Change of Pace' in the right corner. That is 'Victoria Falls' is on the far right middle. These three are almost always the first to bloom. What’s nice about 'Jesse’s Song' and 'Victoria Falls' is they bloom almost all season long, especially 'Jesse’s Song', which is first and last to bloom. A super achiever indeed. So both 'Jesse's Song' and 'Change of Pace' have been given our award. 'Jesse's Song' (Williamson 1983) Here is a collage of 'Jesse's Song' and notice all the buds that are still coming. This iris is a very nice plicata. It was awarded the Dykes Medal in 1990. This striking iris always puts on a good show. I think that it likes plenty of room to spread. This clump has a 6 foot wide path on the right side of it. The clump is always huge. I like the beautifully arched standards and the plicata coloring. 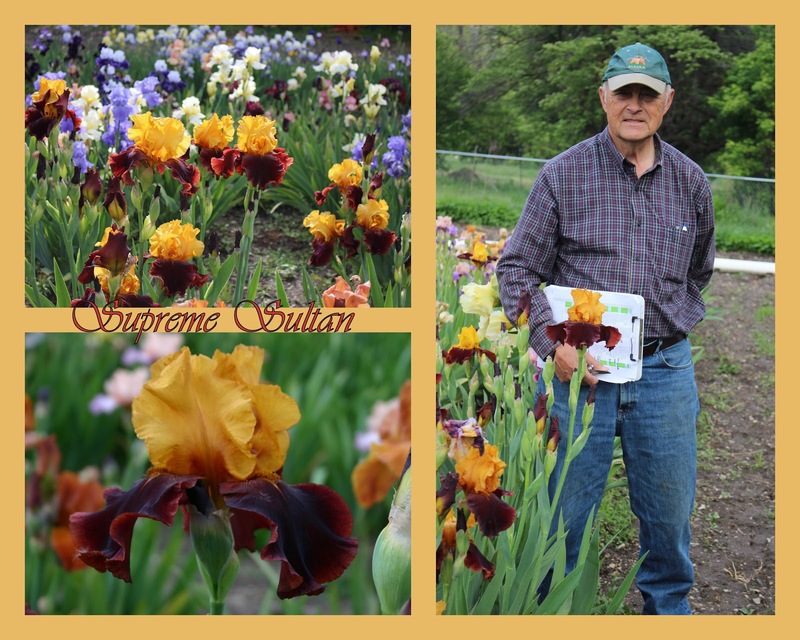 Cooley's Garden sent out this iris to thank us for helping them celebrate their 60th anniversary Year in 1988. This is me standing behind 'Many Thanks' on the level ground. I am about 67 inches tall and as you can see 'Many Thanks' is at least 54" tall. It is on sturdy stems that don't blow over except in the strongest of winds. Both the shape and color are worth the Super Achiever award. This clump is always a Super Achiever. It blooms and blooms and blooms. I also love the reverse bitone coloring with the dark blue-violet standards and lighter falls. It is pretty planted by yellow or orange. This bloom has been around a long time. Isn't it still lovely? It won the Dykes Medal in 1993. It is very ruffled and has excellent form. I also love the glimmer on the petals. The canary yellow and blue violet are so distinct from one another. It is another one that is robust for us every year. This won the Dykes Medal in 1998. This iris is very healthy here and also very tall. Neal is 6' tall and 'Conjuration' is 50-57" tall. It also withstands all but the strongest winds even though the stems are rather thin. The masses of blooms doesn't hurt my feelings either. This delicate colored bloom is such a nice clean color. It has a pleasing form. As you can see it looks good planted next to 'Shipshape' and 'Edith Wolford' or any nice lavender or purple bloom. The first time I saw this bloom in my garden in 2014 it just took my breath away. The ruffling is extravagant and doesn't tear while opening. It makes masses of blooms and photographs like a dream. It is one of my newer Super Achievers. I'll end this blog with one more Super Achiever that didn't win by the number of blossoms or by the size of the clump but by the massive flower itself. It is on ramrod stiff stems and the flower is 7 1/2 " x 5". This variegata (yellow standards with deeper falls which or solid tones of brown, purple or red) is flamboyant and frankly shows off. I love that it has arched golden ochre standards and solid rich mahogany-red falls. It grows very well here. Note the size with Neal holding the clipboard behind it and compare it to his hand which is considered large or extra large. We have had a lot of snow and cold temperatures this winter. I am yearning for mid May to June when our garden will once again look like this. 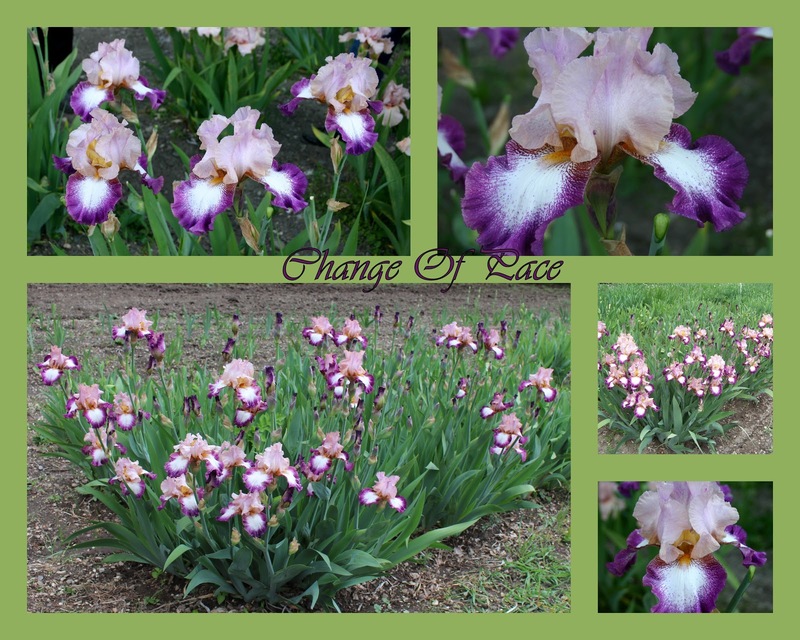 What irises have you found to be especially pretty and hardy in your garden? I would love to hear your comments. Thank you so much Joyce and I hope you can come up again this coming bloom season. Love, Love, Love this article and your garden. 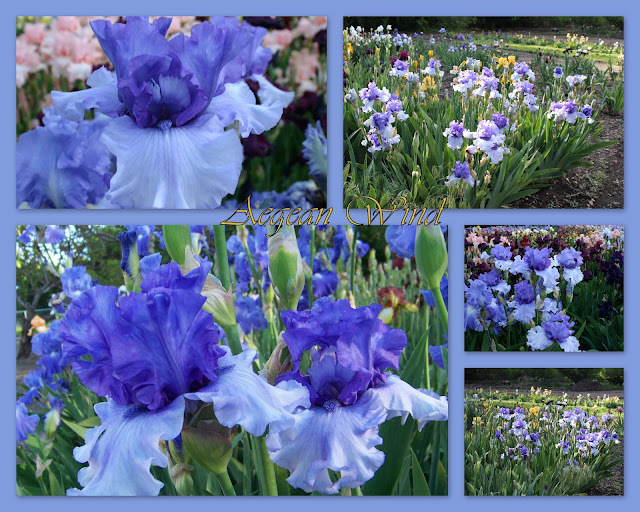 Most home garden pictures show iris planted as a single while your have such a nice big display. Building new beds and planning on planting my favorites in larger groups. 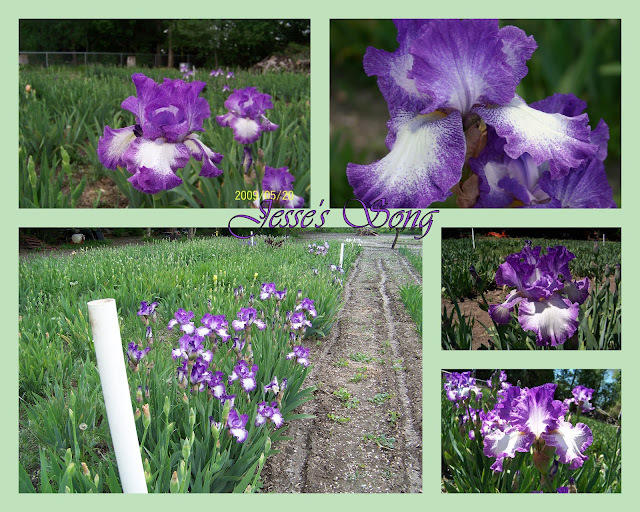 How to pick which iris will be the best growers, tallest with best blooms? After 2 years in the society hoping this springs blooms will show me who my super achievers are. Going to the AIS national convention last year really helped too. If only there were more articles like this! Thank you and your garden is just lovely. I wish I could have gone to the convention. All reports of it and photos were that it was super sensational. I did visit Schreiner's and Cooleys garden a number of years ago and was so impressed with their weed free, and dead blossom free beds. How do they do that? 'Jurassic Park' (Larry Lauer, R. 1995) has never let me down. Huge blooms, one of my first to bloom and very sturdy stems that even our Missouri thunderstorms can't bend. And the colors are breathtaking. 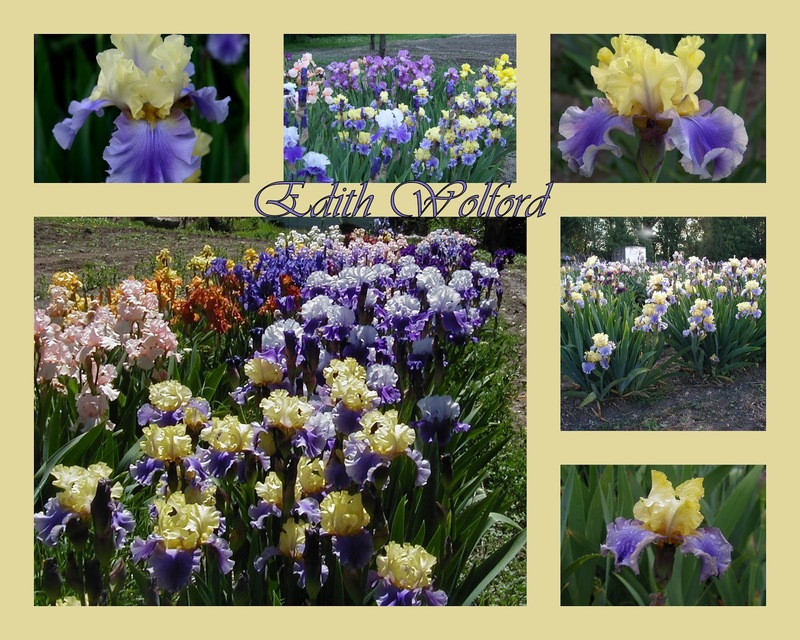 It has 'Edith Wolford' in its pedigree, so maybe it has her to thank. Regardless, I absolutely love it! I have that one too but it is planted over under the 80 foot trees and doesn't get as much full sun as it should. I hope others will read your comment and write that down as a good performer. Thanks for commenting. What an outstanding article, with stellar pictures to match! Thank you so much for sharing. These are truly breathtaking varieties. Thank you so much. I have part two in my mind but have to round up the photographs. 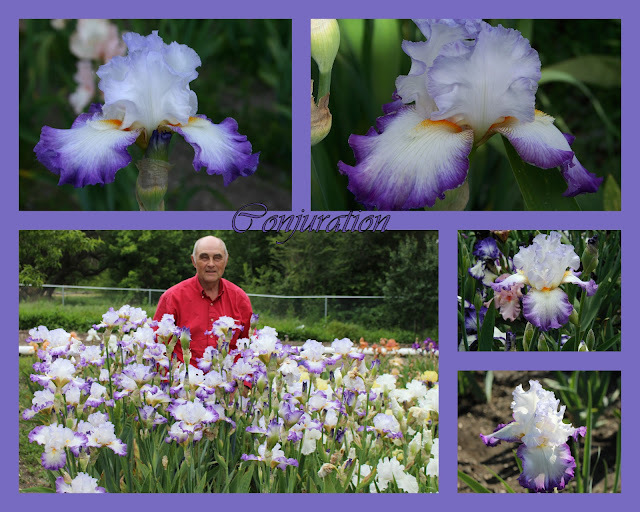 Last year on May 24th 200 different iris bloomed and I didn't get the captions on all of them. I need a crew but can't afford one. I live in the high desert of Southern California where the winter can get to 15 degrees and the summer over 105 degrees. Some of my favorites are Acoma, Alpenview, Angel Chiffon, Autumn Echo, Blue Gown, Blue Sapphire, Bridal Icing, Dreamwalker, Frimousse, Gay Paree, Indigo Princess, JUMBO JACK, Laurie, Long's Peak, Mussolini, Olympic Challenge, Queen's Circle, Sable, Sapphire Hills, Tropical Butterfly, Whitewater Rapids, Wild West Wind, and Zantha. These were the "wower's. I love some of my noids and so many more but this list will have to do for now. I don't have very many of those except Queen's Circle (a stunning one) and both the Sapphire ones. I think that it is always good to mention zones and growing conditions because what does well for us may not work for Canada or Australia or Eastern or Middle U.S. Thanks for your response. It is so nice when we share experiences. This is my favorite article by you! Great job. I think you know my best and favorite performers. We'll get together and talk "iris" soon, okay?! Oh Susanne, you are such a support for me. Thank you. Yes. please come soon. We need to plan my new courtyard bed. The other plants for the new back yard are being ordered by the landscaper as we speak. Thank you Andi and I appreciate the write up of the 5th anniversary of this blog. I think I figured this was my 14th blog. I appreciate the opportunity to reach out to other iris lovers. Thanks for your encouragement. Nice article Dawn. I do not have many of the iris you mention. Going to try a few. I hope they do well for you. Most are available somewhere except 'Many Thanks' may be hard to find because Cooleys is now out of business. You might want to ask one of the Iris groups on FaceBook if anyone knows where to locate it. Hi, I am here in St George, UT. Can you recommend some good rebloomers for this area? Thanks! I don't know that area well enough to know which iris do the best there. 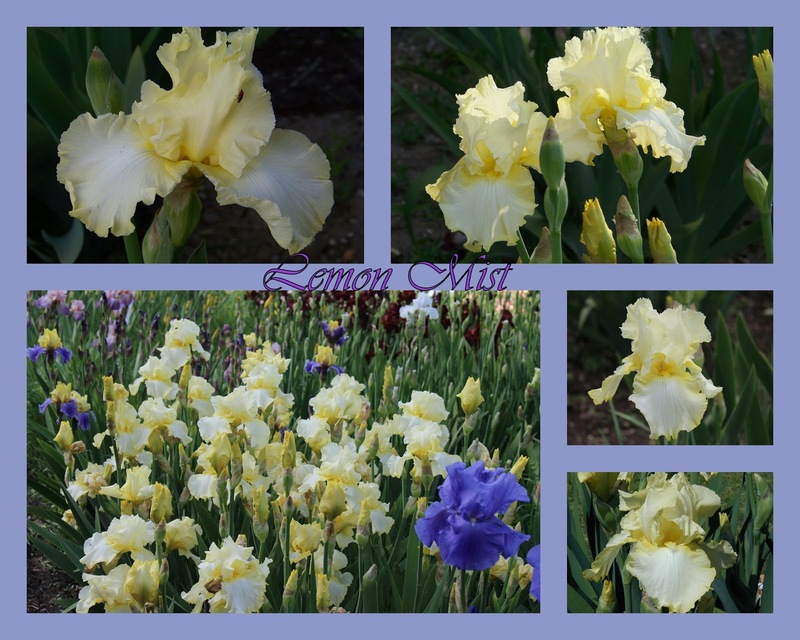 There are 5 groups on Facebook that I am a member of that all love irises. I suggest you ask that question there. People have been kind to answer questions. I have a friend in Simi Valley CA where it gets hot early like St. George does and she says she grows a lot of iris that are E for Early bloom time so they come out before it gets too hot. I will look up her article and send a link. http://theamericanirissociety.blogspot.com/2015/11/late-season-favorite-iris-coral-chalice.html is the article that Renee talks about growing early irises. Love your list. Moist of them are my top performers also. I would add Stairway to Heaven and Local Color. I don't have local color but my 'Stairway To Heaven' is outstanding. Local Color is very nice. I'll be doing part 2 of the Super Achievers soon and you can compare to yours.